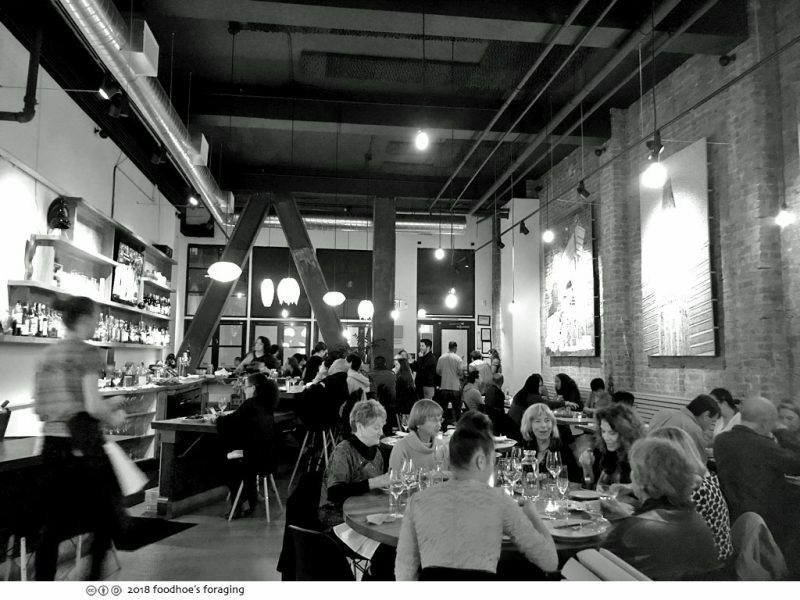 We’re halfway through Oakland Restaurant Week which runs through two weekends from January 11-21, so there’s still have time to get out and take advantage of some great dining deals. This year there are 70 restaurants offering special lunch and dinner prix-fixe menus or other dining deals ranging from $10 to $50. Mr. K had lunch at Mockingbird a few weeks ago and kept raving about the brussel sprouts, so when I saw that they were doing a Oakland Restaurant week deal, I made reservations for dinner last weekend. We got there early and were promptly seated while the host told us that we still had time to order drinks from the happy hour menu . The interior has lovely high ceilings and the exposed brick walls and sturdy metal beams give it an industrial lofty feel. You can see an upstairs mezzanine in the back which looks cozy and intimate. 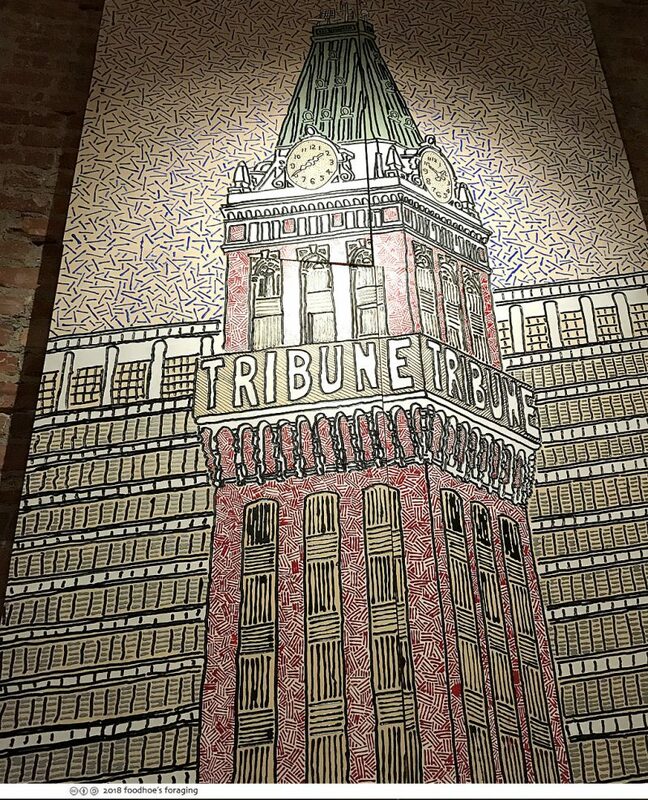 We sat underneath this stylized panel of nearby Oakland landmark the Tribune Tower by local artist Rick Oginz, that I took delight in admiring during our meal. We enjoyed the company of our neighbors, a young couple who were expecting their first son any day now, and the servers were all professional and friendly. We wanted to try different things on the menu, so ordered one of each when possible. 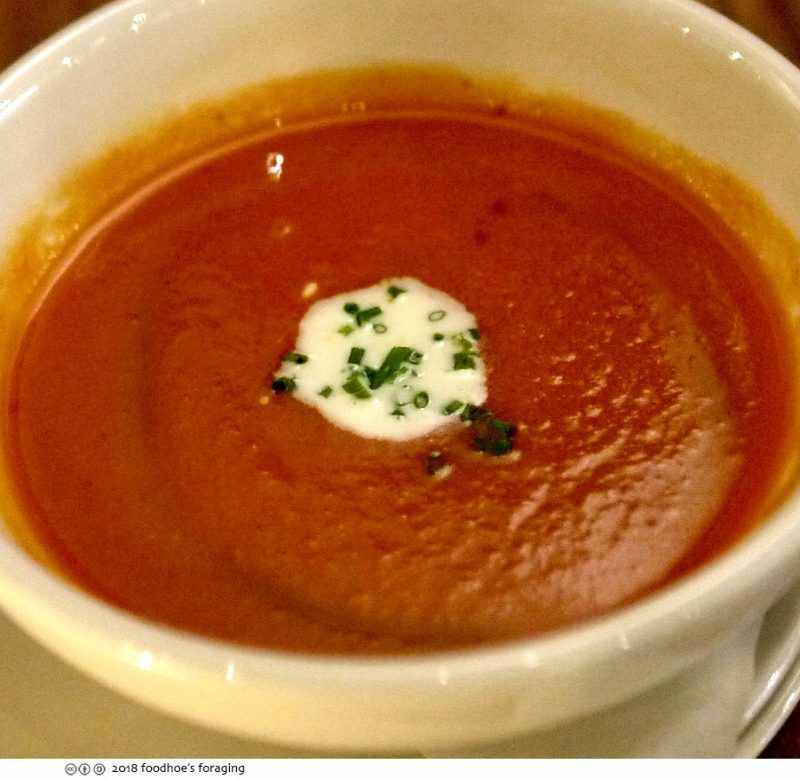 The Smoked Tomato Soup with creme fraiche sprinkled with minced chives was fragrantly smoky and pureed to a smooth velvety texture. The bright flavors of the creme fraiche and fresh herbs were a tasty accent. 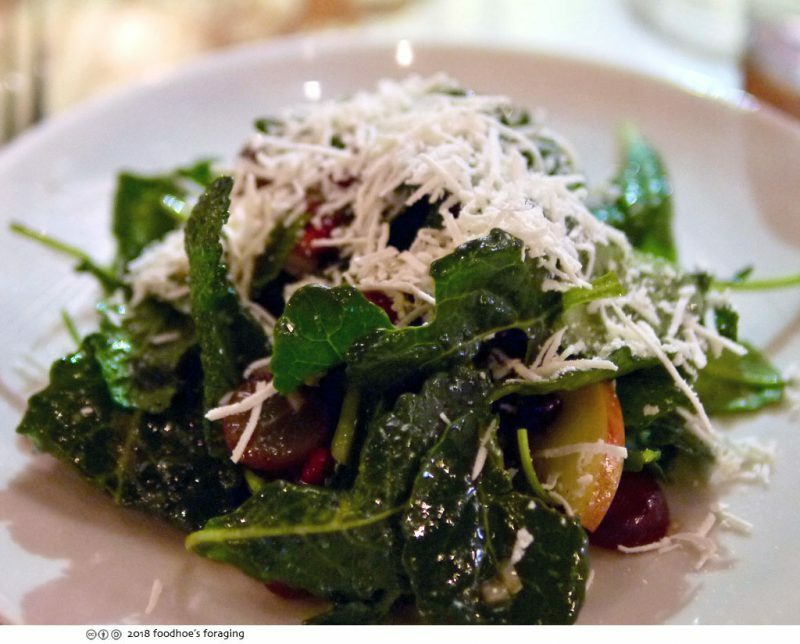 The Winter fruit and baby kale salad was topped with toasted pumpkin seeds, tossed in a fragrant sherry shallot vinaigrette and the mild buttery ricotta salata melted on our tongues in a very satisfying manner. 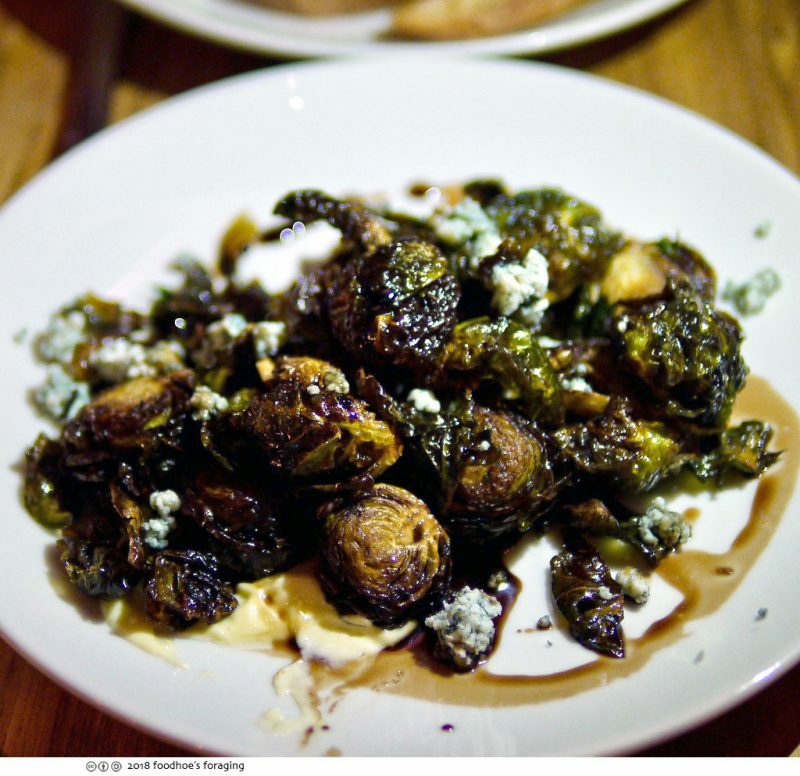 The fried brussel sprouts were the best ever, and that’s saying a lot these days where it’s on everyone’s menu… The texture of the outer leaves was crispy and well seasoned surrounding a tender and moist core, topped with pungent bits of rich blue cheese and served over drizzles of confit garlic aioli and saba (reduced grape juice similar to balsamic). We couldn’t stop eating this and wouldn’t let the server take this dish away until we finished it all. 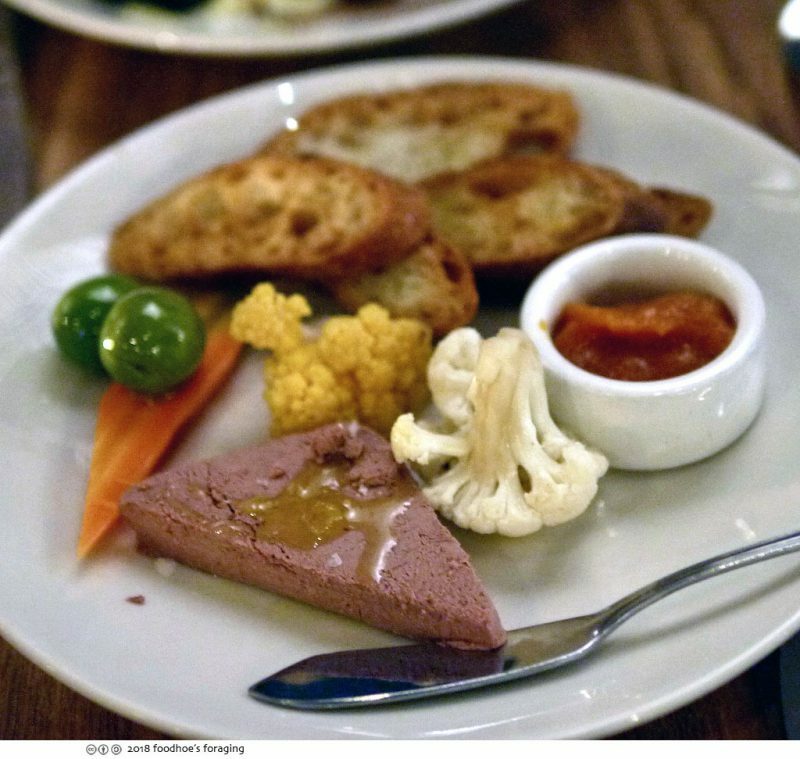 The Duck liver mousse was rich and so good spread on the crisp bread with some apricot jam along with bites of the buttery castelvetrano olives. The pickled vegetables were a lovely accompaniment, crunchy and piquant but a little too sweet for me. There were three entrees to choose from, we shared the Winter vegetable tagine, a pile of lovely winter vegetables (carrots, cauliflower, broccoli and mushrooms) slow cooked in a richly spiced sauce, sprinkled with castelvetrano olives, a generous scoop of delicious lemon yogurt and fresh cilantro that really brightened up the dish. 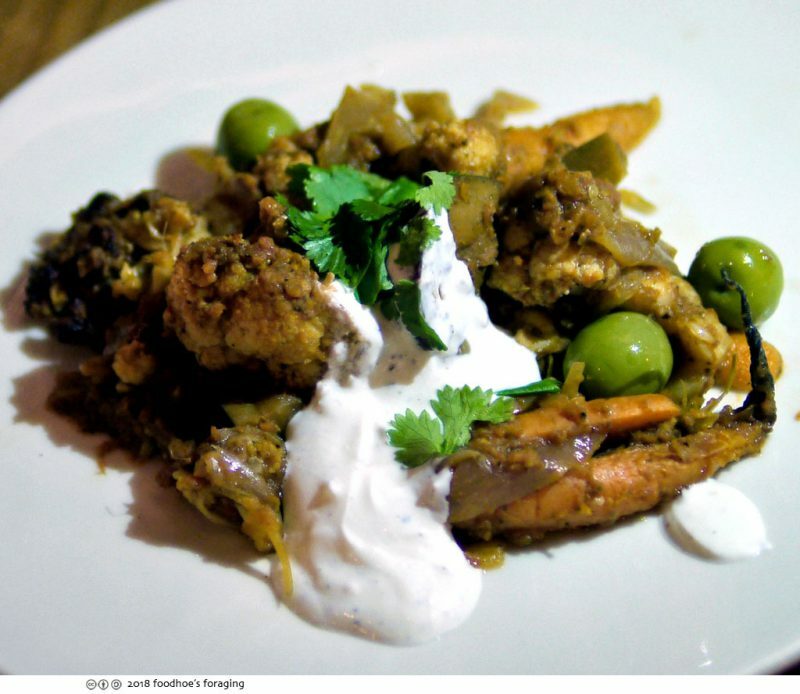 The Moroccan spiced chicken, was a half bird cut into two juicy pieces with an excellent crispy crust served over gorgeous roasted rainbow carrots, chickpeas, greens and drenched in an herbed buttermilk dressing. 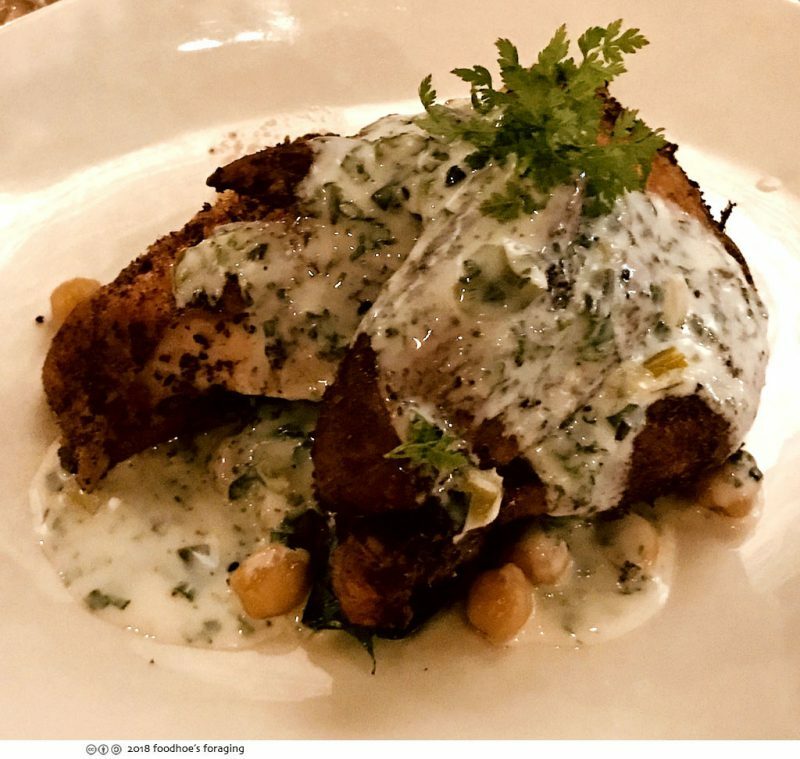 An intriguing combination of penetrating flavors and textures, the chicken reminded me of southern fried chicken with the buttermilk dressing, but with a north African twist. The other entree option was a slow cooked Pork Sugo with crispy polenta. 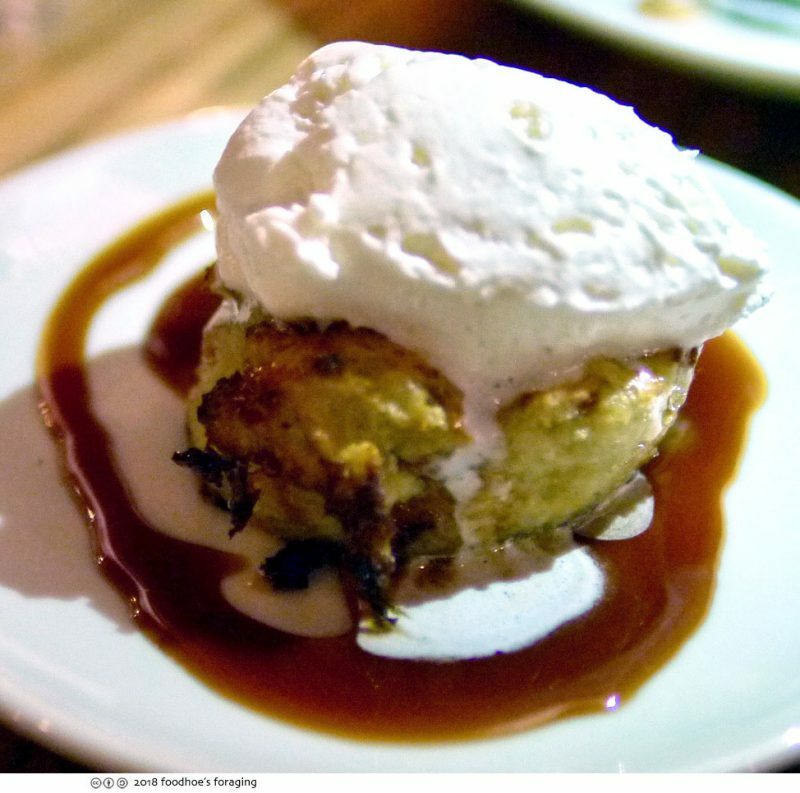 Of the two desserts, I loved the Mockingbird bread pudding, a traditional bread pudding made from Acme focaccia, infused with vanilla and nutmeg custard, served over salted caramel sauce and topped with soft whipped cream. There was a toasty crust with deliciously crisp edges, and the interior was creamy and cloud like. I ate this all by myself… well, maybe I let Mr. K try a miserly bite or two. 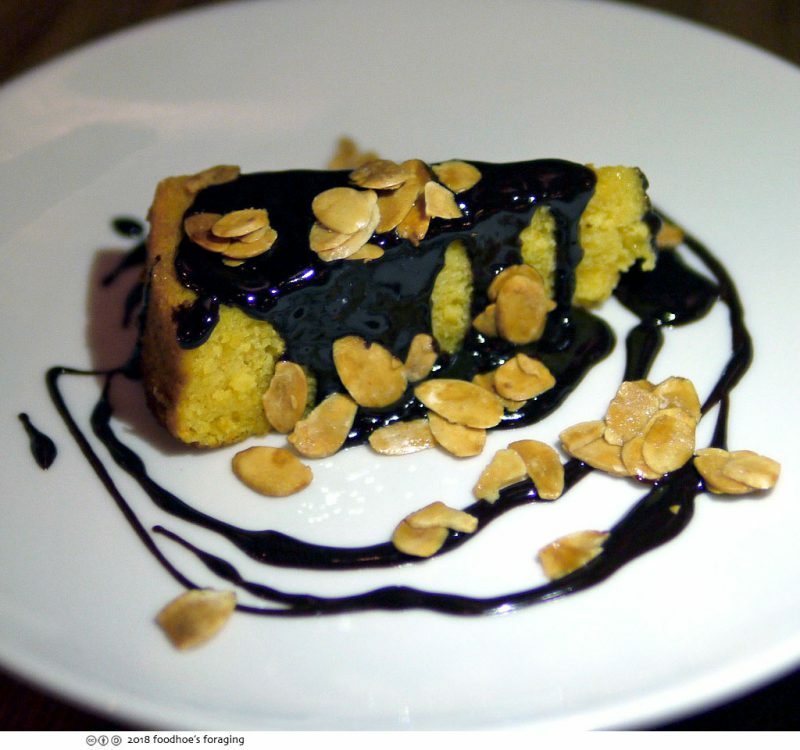 The Citrus almond flour cake, was topped with a sticky dark chocolate ganache & candied almonds, it was more of an adult dessert, not too sweet but dense and I felt it needed some of that whipped cream or maybe a scoop of ice cream. 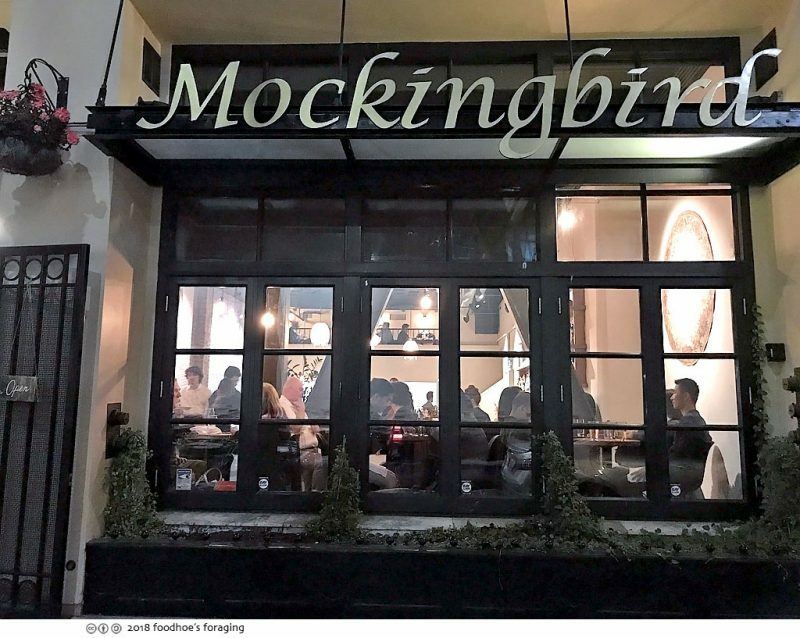 For $40 a person, our four-course meal was quite a feast, and if you haven’t tried Mockingbird Oakland Restaurant is a great opportunity to check it out! We couldn’t finish everything and our server was very happy to box up our leftovers. Afterwards I read that the chef-owner William Johnson, previously worked at Zuni Cafe, Hayes Street Grill, and Spruce, all institutions in the City and some of our favorites. 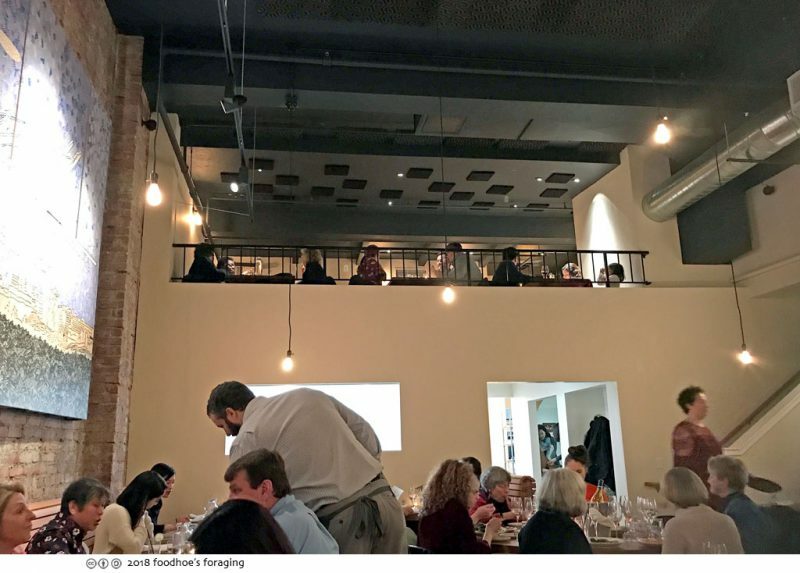 We really enjoyed our meal and definitely plan to go back for the brussel sprouts and to try other dishes on the menu, and it’s so conveniently just around the corner from the 12th Street Bart station. i wouldn’t have shared that bread pudding at all! !